Napoleon Hill (October 26, 1883 – November 8, 1970) was an American author who was one of the earliest producers of the modern genre of personal-success literature. His most famous work, Think and Grow Rich, is one of the best-selling books of all time. Hill's works examined the power of personal beliefs, and the role they play in personal success. He was also the advisor to President Franklin D. Roosevelt from 1933-36. 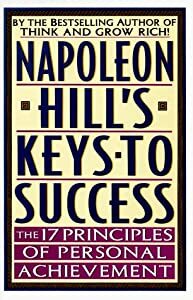 He talks about these 17 principles in his book Keys to Success. Let us look at the 17 Principles which has made his name live long after he has died. FREE Subscription - Click here to get articles like ' 17 Principles of Personal Achievement ' in your Email.